Location. 36° 20.622′ N, 82° 15.023′ W. Marker is in Elizabethton, Tennessee, in Carter County. Marker is on West Elk Avenue (U.S. 321) west of Franklin Club Drive, on the right when traveling west. Touch for map. The marker is on the edge of the Sycamore Shoals State Historic Area. Marker is at or near this postal address: 1651 West Elk Avenue, Elizabethton TN 37643, United States of America. Touch for directions. The marker stands to the left of the Transylvania Purchase marker on the grounds of the Sycamore Shoals State Historic Area. (within shouting distance of this marker); Green Hill Cemetery (approx. 1.1 miles away); Cedar Grove Cemetery (approx. 1.3 miles away); Sabine Hill (approx. 1.6 miles away); Range School (approx. 1.9 miles away); Covered Bridge (approx. 2.1 miles away). 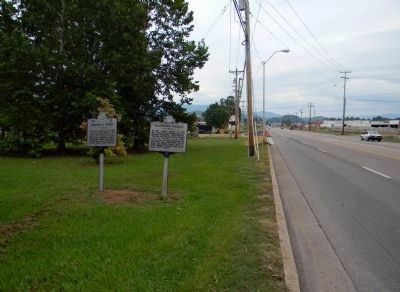 Touch for a list and map of all markers in Elizabethton. More about this marker. 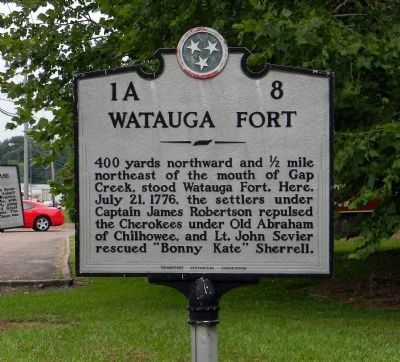 Watauga Fort is also identified as Fort Watauga or Fort Caswell in various publications. More. Search the internet for Watauga Fort. Credits. This page was last revised on June 16, 2016. This page originally submitted on September 15, 2011, by PaulwC3 of Northern, Virginia. This page has been viewed 879 times since then and 14 times this year. Photos: 1, 2. submitted on September 15, 2011, by PaulwC3 of Northern, Virginia. Editor’s want-list for this marker. Photos of the recreation of Fort Watauga at the Sycamore Shoals State Historic Area, and photos of the DAR monument at the approximate location of Watauga Fort. • Can you help?